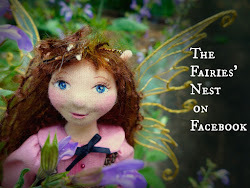 The Fairies Nest - OOAK Cloth Dolls & Fiber Fantasies: Happy Solstice from The Nest! Happy Solstice from The Nest! See?! 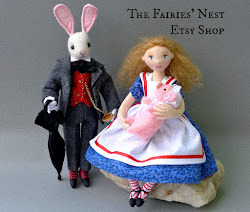 Now I have been promised that it will all be finished by the end of next week but I'll still have to move everything back in, get the rest of the house cleaned up, and find time to make some dolls all before the show July 18th. No problem, right? Yikes!!! So there, proof...I must be out of my mind! I do plan on hosting a fabric swap but I think it will have to wait until after July 18th so plan on coming back to sign up then. And I promise to post pictures of my lovely new kitchen soon....fingers crossed! So if I'm a bit absent in the next few weeks, you'll know why. I'm flying in 20 directions at once and making magic happen. Well, what else would you expect from The Fairies Nest? Of course it is Winter Solstice here - always nice to know that the days are getting longer, though. How are you managing to cook at the moment, BTW? 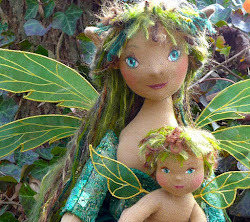 OK you are a little crazy, but if you go out and dance in a fairy ring good luck will come your way! You poor dear! We are also in the middle of renovations but to a whole house. What a nightmare! So I can totally relate. The little tile paper you had in your kitchen before, I used to have in a couple of different kitchens I've had. Love that contact paper! I wish you muchl luck and sucess in your projects! Ah...yes! Of course...Its summer and you can live on grills and salads. We re-did our kitcken a few years ago, but it turned into the project from hell. we had a wood-fired cooker plumbed into the hot water - needless to say, the new kitchen entailed complete new plumbing, new bathroom, most of the house re-plastered....and so on. It was worth it in the end - I love the new look, and I don't have the daily battle with a cantankerous wood-stove! I think we ate a lot of take-aways. Kitcken?? Well, of course I mean kitchen! I feel so much better knowing I am not alone in my crazy! :) Susie your kitchen project sounds much more involved than mine...although new plumbing is still in the forecast...comes with the 100 year old house! JoAnna, your whole house?! I am in awe! I too love that tile wallpaper and in fact, I'm putting new sheets of the same stuff back in the new one. Some things are too good to change! Your new kitchen is beautiful! Sounds like you have a full but exciting plate. Shame on me for not checking in more often. I'm always glad I did. That which does not kill you only makes you stronger...words of wisdom.. But it will be so well worth it!!!! How fun!! I feel for you having to make dolls in time though. Yikes! I can't ever concentrate on art while working on a house project. Can't wait to see the finished pictures. Oh wow, we are fixing to do this to the kids' bathroom. We are starting small and getting things as we can. So far we have the sink and some fixtures. Next is a new shower. Remodeling is so much fun, I can't wait to see the finished pictures. And those baking shoes are just too cute! !